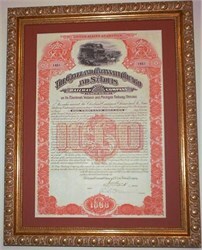 This $1,000 gold bond was issued on its Cincinnati, Wabash and Michigan Railway Division. The vignette pictures a cowboy crossing a river on horseback as a train steams by. Also, featured are two large architectural medallions on either side of the vignette. This orange certificate with ornate border is framed in an antique gold wood frame which is 1 1/4" wide. The overall frame size is 14 1/4" x 18 1/4" and is ready to hang. The price includes priority shipment within the U.S. International shipment and overnight delivery is available at actual cost. Cornelius "Commodore" Vanderbilt (1794-1877) and his descendants owned the controlling interest in this railroad company which was one of several in their railroad empire. Vanderbilt amassed a fortune of nearly $100 million prior to his death. At the time of his death, he was the richest man in America. His Will provided $1 million to establish Vanderbilt University in Nashville, Tenn.
Cornelius Vanderbilt was born to a poor family and quit school at the age of 11 to work for his father in boating. At the age of 16 he persuaded his mother to loan him $100 for a boat to start his first business. He opened a transport and freight service linking New York City and Staten Island. He had a reputation for honesty, reasonable prices, and hard work. Vanderbilt got his nickname "Commodore" being in command of the largest schooner on the Hudson River. In 1818 Vanderbilt turned his attention to steamboats. By the 1840's he operated more than 100 steamboats and his company had more employees than any other business in the United States. By 1867 he had gained control of the New York Central and other railroads. Cornelius "Commodore" Vanderbilt is one of the most famous American capitalists who found great wealth and prosperity in controlling and developing great railroad companies.